When you decide to take that leap to book a plane ticket and venture off towards a new place and a new environment, it’s so easy to get caught in the chaos and pure visceral experience of it all, that it seems to sometimes fade away in a blur. Sure you’ve got you Iphone or a camera to capture those picturesque moments but although a picture can ‘say a thousand words’ it can be difficult to capture the feeling of a day or an event. Bringing along a journal is a great way to document the people you meet, the experiences you’ve had, and the feelings you’ve felt in a completely subjective and personal way. However, it can be tough. You start out by writing daily, keeping track of your bus tickets the things you did and anything else that comes to mind. But a few late nights out on the town or long consistent days of travel and you find you’ve missed quite a few important moments in time. It begins to seem insurmountable to catch up on everything you’ve done, then the thought of setting aside a few hours to write in your journal simply seems daunting. For me, a journal doesn’t have to be a consistent log of your daily occurrences, but instead a means to record the more impressionable moments so that in the future the blurred memory can again become crisp. The key is to write an entry as soon as you have a chance, because whether you like it or not the impression and the feeling of that moment will begin to fade or perhaps change to suit your current mood. It is also important to make sure that your journal simply looks badass. Something that is weathered, beaten, tough, and full of shaman like wisdom and insight. Something that when you look on your bookshelf a few years down the road reminds you of the intrigue you portrayed as you brought it along. 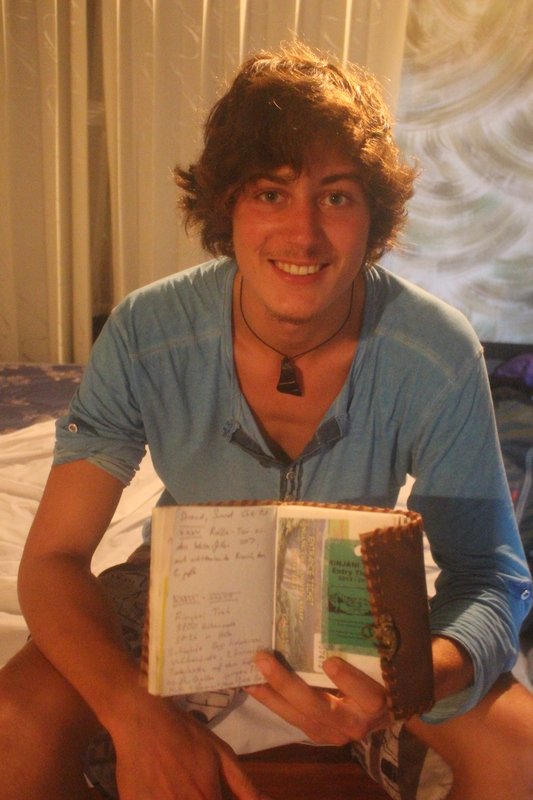 Call it whatever you want; a journal, a diary, an agenda, a daily log – the important thing here is that it is an essential part of any backpackers’ inventory. As much as I spent a good chunk of time with this fellow, I have a terrible memory and generally fail to maintain contact with the people I meet. Let’s call him ‘Jeremy’ (it started with a J). At 19, Jeremy decided to work at a place he loved for a year, save up some funds and hit the road. Starting in South East Asia and making his way over to Central and South America. This week’s ‘What’s in Your Backpack’ goes out to him! Yes it is always lovely to write something down!! here’s to Jeremy (or the letter J)! Agreed! Although after talking about it a bit more we’re thinking it was Jonas (Silent ‘J’) now.